The latest sibling of front-page racehorses Black Caviar and All Too Hard is a confirmed acceptor for the 2013 Inglis Australian Easter Yearling Sale. The yearling colt, by Champion Sire Redoute's Choice from blue-hen mare Helsinge, will be offered by Rick Jamieson's Gilgai Farm at Australasia's premier sale on April 9 to 11 in Sydney next year. 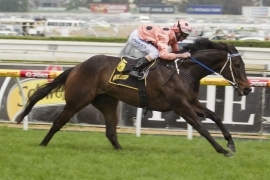 Unbeaten in 22 starts, including 12 at Group 1 level, Black Caviar is the darling of Australia. The mare that stops a nation was recently crowned Australian Racehorse of the Year for the second time. That accolade came on the back of another outstanding 12 months where she was named the World's Highest Ever Rated Sprinter and Mare by the International Federation of Horseracing Authorities. While Black Caviar rests up for an Autumn 2013 campaign her half-brother All Too Hard has taken over the headlines. The most expensive purchase at the 2011 Easter Sale when selling to Hawkes Racing on behalf of Nathan Tinkler for $1.025million, All Too Hard showed he is an outstanding racehorse in his own right when winning the stallion making Caulfield Guineas, a race won by the sire of next year's Helsinge yearling in Redoute's Choice. "Being a half-brother to a Caulfield Guineas winner and by a champion Caulfield Guineas winner makes next year's offering an outstanding prospect, but you then add Black Caviar to the equation and you have the most anticipated colt in Australia's thoroughbred auction history," said Inglis Managing Director Mark Webster. Bred by Gilgai Farm, the yearling colt to be offered at next year's Easter Sale is the fifth foal of well related Desert Sun mare Helsinge, a daughter of top sprinting mare Scandinavia which has also produced Group 1 winner and Eliza Park resident sire Magnus. Besides Black Caviar (1st foal) and All Too Hard (3rd foal) Helsinge has produced Moshee (2nd foal), which now stands at Eliza Park Stud, and ‘Pippa’ (4th foal), which created her own headlines in April this year when she sold for $2.6million to BC3 Thoroughbreds at the 2012 Inglis Australian Easter Yearling Sale. The 2013 Inglis Australian Easter Yearling Sale will be held at Newmarket in Sydney from Tuesday April 9 to Thursday April 11 next year. For further information please contact Jonathan D’Arcy at jonathan@inglis.com.au or+61 2 9399 7999.